Prize Bonds is gold speculation and are possessor type of security available in the denominations of Rs.200, Rs.750, Rs.1,500, Rs.7,500, Rs.15,000,Rs.25000 and Rs.40,000. 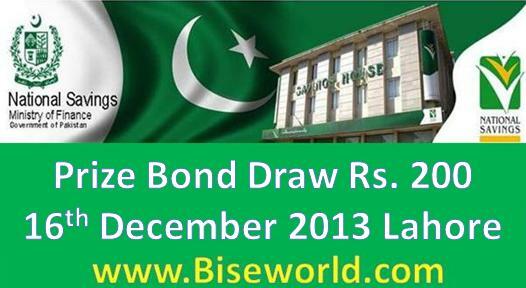 It is the 56th Draw No of Prize bond of Rs. 200 held at Hyderabad City of Pakistan with Common Draw Series. These bonds are issued in series. Each series consist of one less than 1,000,000 bonds. No fixed return is paid but prize draws are held on periodically basis. The draws are held under common draw method and the numbers of prizes are same for each series. It means that if 50 series of Rs.200 Prize Bond are in circulation.